Long time do not see dear readers and Appcoda fans! It's been a long time since my last post here at Appcoda, and I'm very happy to be back! How do you implement communications internally in apps and exchange messages properly between classes or other devices in Swift projects? It is undoubtedly a must-have knowledge for each developer, new or not. Knowing what tools and techniques are available, what works best, where and when, is critical to a proper development process. After all, being able to send messages and data back and forth in classes is not something that one can possibly learn; Instead, it is one of the first things a developer should know about. Usually, not all of these three concepts are met in One post, but one can find a lot about each topic separately. I felt the need to write a training that concentrated all of them as they actually serve the same purpose; Let us exchange messages and data between our programming structures and devices. Through simple words and practical programming examples, I will try my best to make it easy to understand how each concept works. Hopefully, at the end of the training, some valuable lessons will be learned. A programming task without some coding doesn't sound right, so we will work on a demo application that lets us meet each concept as thoroughly as possible given the boundaries of a single post. For sure, what you want to see next is standard techniques that you just have to adjust and use in your projects. And by saying that, let's not lose any time here and let's move on to the interesting things! Happy reading! We're supposed to make our hands dirty, but we don't want to write a full app from the beginning. We just want to focus on important things, as the rest is already done in a start-up project that you should come from here. Keep and view a collection of all shopping lists added to the app. Editing an existing shopping list. Rename and delete shopping lists. Add, edit and delete shopping list items. If you run the Startup project, you don't see much on it. Yes, you can navigate from one viewer to another, but no data can be stored, nor is there any other significant operation you can actually test. And that's because important parts about communication between app classes are still missing. AllListsViewController : This is the place where all shopping lists are collected and displayed. From this view control, you can start creating a new list, edit an existing one, rename and delete. ShoppingListViewController : It publishes all items in a list and lets you create, edit, and delete items. EditItemViewController : The name suggests what is about. You create, edit or delete item list items. ShoppingList : It represents a shopping list programmatically and contains properties for: id, name, edited timestamp and elements of a list. ShoppingListManager : It manages a collection of ShoppingList items, and it offers many useful features. An instance of this structure is used in AllListsViewController display the controller. It is called listManager and it is our tool for managing shopping lists. You can also find a file named NotificationNameExtension.swift . This file is empty, but soon enough will change. More details later. Finally, there are custom cells and custom display implementations. What is particularly interesting among them is RenameListView a custom view that allows you to rename a shopping list. Well, not yet, but at some point it will. Remember that, when we are going to work on it when we are going to discuss closures and actions. Take the time to familiarize yourself with the startup project. Go through the code, examine the display boards and other classes or structures, and find out what is offered in the startup project and what not. When you are ready, continue reading. Delegation pattern comes first! Consider the following two classes, ClassA and ClassB . classBObject runThis ( withFlag : : true ). The disturbing part is: How do we send messages from ClassB back to ClassA ? 19659002] And here's where the delegation pattern comes into play! Let's go through the steps involved in implementing it. Implemented by ClassA so that they perform actions specific to this class. Called by ClassB then ClassB may trigger actions in ClassA or transfer data to it through the function parameter values. As a common convention, a delegate has words as a suffix (it is not mandatory but recommended for clarity in code). var delegate : ClassBDelegate ! Once for the reasons of the convention, delegate property is named as it to make the code comprehensive and understandable. The truth is that it can be named as you like, for example myDelegate customDelegate Monday whatIsThis iLoveDelegates and so further – Okay, just don't!
] ClassB can use the protocol's functions to communicate with his delegate, who is ClassA . An advice: Always make sure that the delegate property is not zero . It is the road map for implementing the delegation pattern. In the hypothetical example above, I mentioned only two classes, but to be honest and more precise, a class that adopts ClassBDelegate the protocol and assigns the delegate's property to ClassB ] may be ClassB s delegate, and therefore establish a two-way communication. Add a new item created in EditItemViewController to articles collection of shopping list ] property in ShoppingListViewController . Update an edited item in EditItemViewController to items collection of the shoppingList property of ShoppingListViewController . Remove an item from the items collection of the shoppingList property of ShoppingListViewController previously deleted in ] EditItemViewController . We start by creating a new custom protocol that we will name EditItemViewControllerDelegate . And we will do that in the file EditItemViewControllerDelegate.swift . Before using delegate the property, let's open ShoppingListViewController.swift file. We will make the [ShoppingLifeViewController class adopt EditItemViewControllerDelegate the protocol and then implement its function. In the function body we add the object in the elements collection of the object shoppingList and we update the table view so that the new item is displayed. You may be wondering why to make even the delegate of ] EditItemViewController takes place in prepares (for: transmitter :) method. Well, that's because prepares (for: sender :) invoked when a segue is triggered, and is the place where we make some configuration regarding the display controller to be presented before being presented .
] Well, right between the action that makes the line transmitted and the actual presentation of EditItemViewController is the prepares (for: transmitter :) method that can be used to do custom things about the upcoming display control. And we do. Note: The best place to put your class as a delegate of another class is right after the initialization of the latter. In our case and page EditItemViewController is a view controller that is initialized automatically by the victory, prepares (for: send 🙂 the method is the only place we can consider as the initialization site. We access our view controller by using the segue.destination property and casting to that type. Back to file EditItemViewController.swift where we are ready to create Save button work. To update our memory, our goal is to enter a product name in the text box and by pressing the Save button to send the appropriate item to ShoppingListViewController so that it is added to the collections and finally displayed to table view. if la delegate = delegate shouldAdd ( topic : text ). navigationController popViewController ( animated : true : true : ?. First, we make sure that the user has written something on the text field, and they not only try to save while the goods name is missing. Next, and that's important, we make sure that the delegate is not zero. Then we call shouldAdd (item :) the function of the EditItemViewControllerDelegate protocol, and text as the argument representing the newly added item. Finally, we reject the display controller by by jumping from the navigation stack and we return to our handlist. That's it! The delegation pattern has been used since The EditItemViewController class can now speak back to the class ShoppingListViewController by letting it know that a new item has been added, and by delivering the relevant item at the same time so that it can be handled further. You're welcome to test the app now and create fake merchandise. Every thing you add is saved when you press the Save button! But wait a moment. What if we add two or more times the same item? From the user's point of view, the app should not add an item if it already exists. It does not & # 39; It makes sense to have a shopping list where we can add milk 15 times or tomatoes 10 times. Let's try to fix it. But the problem is: We have no information about whether the product already exists or not at the time of storage, so we can avoid adding it to the shopping list again . Trying to handle it by sending the whole item collection from ShoppingListViewController to EditItemViewController is obviously a very bad idea, totally counteracting and bad practice. So, what can we do? In most cases, you want to create delegation-related protocols, their functions will not return any value . The only delegate function we have implemented so far ( shouldAdd (item :) ) is the best example of what features you most likely will create in such protocols. But delegated functions can return a value coming from the class that adopts the protocol and has been set as the delegate class. In other words, and about our demo specifically, such a delegate function can return data directly from ShoppingListViewController class. Let's ask ShoppingListViewController if the item we are trying to save already exists or not before saving it, and if it does not exist, we allow it to be stored, otherwise we will not ! This function returns a Bool value. When that's true, the item we're trying to add is already so we don't just keep it. When it is wrong, the item does not exist and we can add it to the collections.
] / / The contents of the rest. The information we need can now be provided from ShoppingListViewController to  012] EditItemViewController when necessary, however, we must update our previous storage shoes those in EditItemViewController so we can actually make use of it. Let's pay a second visit to the saveItem (_ :) IBAction method in the file EditItemViewController.swift . Our update will make shouldAdd (item :) the delegate function called only if isItemPresent (item :) returns false. Otherwise ... let's be polite! We present a notification that informs users that the current item has already been added to the shopping list. // so let's add it now. // There are already elements in the collection. // Show an alert to indicate it. // so let's add it. ] shouldadd ( topic : ] text. // The product already exists in the collections. Running the app again will show that this new addition we just made the solution we have been looking for! If the item is found, then we replace it with the new value and the table view is reloaded, otherwise nothing happens. We’ll go now to the saveItem(_:) IBAction method in the EditItemViewController for a third time, as we need to update it even further. We’ll focus on the case where the item we’re trying to save is not present in the items collection, and we’ll check to see if we’re editing an item or not. We can achieve that simply by checking if the editedItem value is nil or not. If it’s not nil and therefore we’re editing an existing item, we’ll call the brand new delegate function we implemented in this part. Otherwise, we’ll save the item as a new one. // This is the point of interest. // If the editedItem is not nil, then an item is being edited. Test the app again. Now it’s totally possible to add, edit and remove items in the shopping list! Employing iOS SDK’s NotificationCenter class to send notifications is a great way to exchange messages internally in your app. Notifications may contain or not data, and it’s a good way to support communication among various parts of the app that are either directly related or not. The particularly interesting thing with notifications is that the sender (the creator of the notification) broadcasts a message, and anyone observing for it can get it and perform its own actions. Even though we won’t take advantage of that feature of notifications here (we’ll stick to one-to-one communication, not one-to-many), you should be aware of it in case you need it. Post the notification. That happens on the sender’s side, and it’s the place where we include any additional data that might be required by the receivers of the notification. Observe for the notification on any class or struct that required. Implement a function that defines all the actions that should take place when the notification is received. Custom names must be given to custom notifications, and naming is quite important, because it makes it easy to distinguish notifications. Keep that in mind, as having multiple custom notifications in large projects can become really confusing, and good naming can save you time from searching around what each notification is for. More about that is coming right next. Back to our demo project. So far, we are able to add items to a shopping list, however we don’t keep that list into the collection of lists in the AllListsViewController. What we are obviously missing is to make the ShoppingListViewController class capable of saying to AllListsViewController that a new list has been created. Based on what we’ve seen so far, we could use delegation pattern to achieve that, but no! This time we’ll do it with notifications! The first will notify AllListsViewController that a new shopping list has been created. The second will notify AllListsViewController that an existing shopping list has been modified. The sender of both notifications will be the ShoppingListViewController class, as that’s the one knowing when to post them. AllListsViewController will observe for them, and it will perform certain actions upon receiving them. Before we start implementing, let’s focus on the notification names first. A notification name is of Notification.Name type, where Name is a struct in the Notification class (find out more here). Extending Notification.Name struct with custom notification names is considered as a best practice so they’re widely available all over the project. That way not only is unnecessary to remember them, but it also helps to avoid typographic mistakes. Plus, Xcode will auto-suggest them! Both names describe what they are all about. They are declared as static properties, so they become part of the type and we don’t need to create instances of Notification.Name so we can use them. Reminder: These are not notifications, they are just names we will give to the notifications that we will create next. Now that our custom notification names exist, let’s post our first notification. Head over to the ShoppingListViewController.swift file, and look into the updateParent() method. This method is called every time the back bar button is tapped, so it’s the best place to let AllListsViewController know that we have finished creating or editing a shopping list. object expects for a single value of Any type and it can be nil. userInfo is an optional value too and it expects for a dictionary into which you can have as much data as you want. Note: AnOptionalObject and AnOptionalDictionary are fake values. post(name:object:): It creates and posts a notification with an optional object (Any object). Keep it nil if you don’t want to post any data along with the notification. post(name:object:userInfo:): It creates and posts a notification with an optional object or a dictionary. It’s similar to the equivalent notification initializer. Pass nil as an argument to any parameter (object or userInfo) you don’t want to send data for. The above will post the .didCreateShoppingList (Notification.Name.didCreateShoppingList) notification and it will include the items collection as the notification’s object every time we tap on the back button in the ShoppingListViewController. We set nil to the userInfo dictionary, there’s nothing more to post. With that line, we are adding our class as an observer of the didCreateShoppingList notification to the Notification Center, and we’re telling our app to call the handleDidCreateShoppingList(notification:) method upon receiving it. This method doesn’t exist yet, so let’s go straight ahead to create it. The first thing we do here is to make sure that the object property of the notification has an actual value. Always do that check and never use the object property directly if you want to be safe and away from app crashes. At the same time, and if object is not nilwe cast it to an array of String objects, as the didCreateShoppingList notification brings along the collection of items added to the shopping list. The rest of the code is specific to the demo app we’re building. We create a new ShoppingList object that will get the proper ID, the default list name, the current timestamp and the items collection. That object is added to the lists collection of the listManager object in the AllListsViewController view controller, and finally the tableview is reloaded so we visually reflect any changes made. 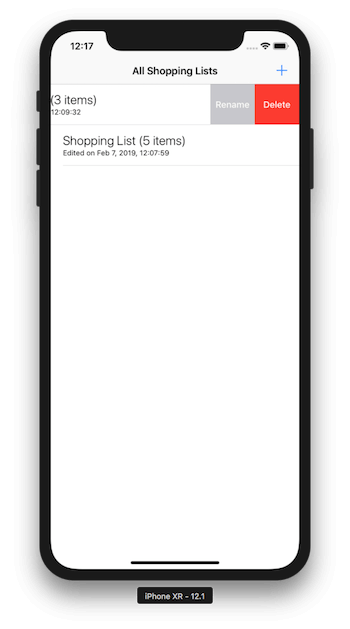 If we run the app at this point and we create a new shopping list, it will be listed in the AllListsViewController view controller. Now that we made it possible to save and show a new shopping list in the AllListsViewController view controller, let’s keep on working on the same logic and create a new notification that will enable us to update shopping lists properly. By testing our demo app on its current state, we can see that it’s possible to edit an existing shopping list, however every time we go back to the initial screen the list is not updated; a new entry is being created instead. That behaviour is pretty much expected, as the only thing that happens when we tap on the back button in the ShoppingListViewController class is the notification posting that “says” to AllListsViewController to create a new shopping list. So, it’s necessary to go back to ShoppingListViewController.swift file and revisit the updateParent() method to change that. When a new shopping list is being createdthe shoppingList property in ShoppingListViewController has no id value (it is nil). On the contrary, when a shopping list is being edited the id property of the shoppingList object has a value and it is not nil. The first is the notification name, which is obviously different than the first one. The second is that we are not using the object parameter value here. Instead, we are making use of the userInfo dictionary and we pass two different kind of data: The id of the edited shopping list, and the items collection. Note that it’s necessary to make sure that the userInfo dictionary is not nil before proceeding. After that, we just update the list in the shopping lists collection of the listManagerand we reload the tableview. Build and run the app again. 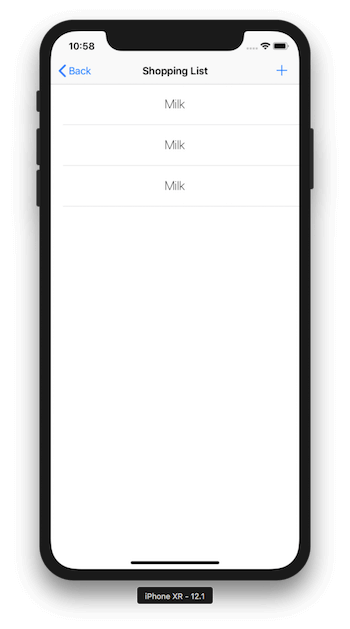 This time you’ll see that when you edit a shopping list and then go back to the first view controller, it is properly shown in the tableview. Moreover, the last updated list is shown to the top. Add the above to the AllListsViewController class right after the viewWillAppear(_:) method. Apart from delegation pattern and notifications, there is one more straightforward, less used probably, method to send messages among classes in an app: Closures and action handlers. Most probably, the nature of writing closures is what it makes it less attractive. That shouldn’t be happening though; the powerfulness of this method can be seen once someone understands how to write them. To have a first understanding about how this approach works, think again of the two hypothetical classes we talked about earlier, ClassA and ClassBwhere ClassB is the one that needs a way to talk back to ClassA. Think of it like that: You pass a function as the parameter of another function. In this example, handler: () -> Void is the function parameter. In this case it has no arguments, and it’s a void function, something that must be explicitly declared. Why @escaping? Shortly, so we can access the action handler (the closure) after the execution of the method has finished. Read more here. Next, myMethod(handler:) keeps a reference to the the handler parameter in a class propertyso it can be called when it’s necessary for ClassB to communicate with ClassA. var actionHandler: (() -> Void)? It’s an optional value, as by default it points to nothing. // notifies ClassA that its work is complete. // successfully "talked back" to ClassA. The above is one of the simplest ways to perform animations on iOS, and there are serious chances that you have seen something similar or written animations already, so most probably it looks familiar. The specific code above is taken straight from the demo app, and it can be found in the AllListsViewControllershowRenameListView() method. See that there are two handlers here: One that is called to perform the actual changes in the UI that produce the desired animation (animations closure), and one to notify that animation is finished (completion closure). An action handler being last in a method or function is usually called completion handler because most of the times it signals the end of some process. Before we focus again on the demo app, you are encouraged to make a search on the Internet about closures, action and completion handlers so you have a better understanding of everything discussed here. After that introductory discussion above, let’s become specific again and let’s talk about our demo app. Our goal in this part is to enable renaming of shopping lists. 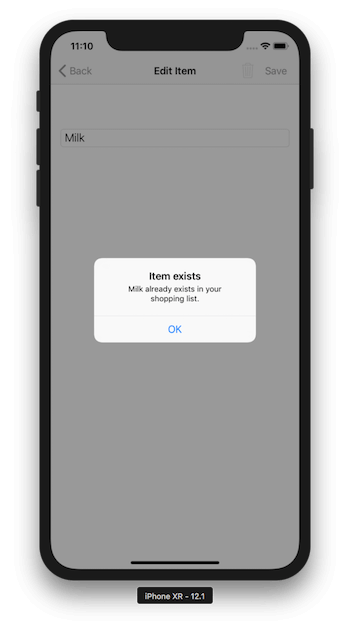 In the starter project, a swipe-left gesture on a list in AllListsViewController reveals two options that allow to rename and delete the selected shopping list. So far, a custom view called RenameListView shows up when tapping on the Rename context button of any shopping list cell, but none of the Rename or Cancel buttons in it work. And our mission is to change that. var cancelHandler: (() -> Void)? The handleCancelRenaming(handler:) method will be called through the AllListsViewController class in a while. Here we just define it, but it’s crucial to keep the action handler out of the scope of that method so we can access it later on. That’s why we assign it to the cancelHandler property. Note: Consider the above two steps as a standard procedure when you implement action handlers as a communication solution among classes. Of course, naming won’t be the same, as well as any potential parameters in action handlers. Despite that, logic remains always the same! Since cancelHandler was originally declared as an optional, it’s really vital to make sure that it is not nil. What we did so far doesn’t mean that the RenameListView will actually disappear; there is no code for that! All we did was to make it possible to call an action handler when the Cancel button gets tapped. We are still missing the implementation of that action handler. Open the AllListsViewController.swift file, and go to showRenameListView() method. There is already some code in the body of that method, and it’s the place where renameListViewa RenameListView class object is being initialized and makes the respective view appear when the Rename context button is tapped on a cell. Note: self is necessary when referencing class properties or methods through closures. The Cancel button in the rename view is fully working now! And if you think about it, RenameListView class says to AllListsViewController when to make it disappear, so our goal has been achieved! We are not done yet though. Let’s follow the same process, and let’s enable renaming. The steps needed for that are pretty much the same as above. The only difference here is that we’ll see how to carry data around: The new shopping list name. var renameHandler: ((_ name: String) -> Void)? Watch the new thing here: There is a parameter in the handler method. Notice that the text value is given as an argument to the action handler, which is expecting for it since we declared it that way. It is not allowed to call the handler without any arguments, or with more arguments than the expected one. You should always pass as many arguments as the parameter values in the handler declaration are! In the above snippet, we first make sure that the index to the edited list exists, and then we access that list through the listManager property and we update its name. Of course, we also reload the table view so the new name gets displayed. But besides all that, the most important thing is the way closure is written when there’s a parameter (or more) in the handler, and how that parameter is used. That’s it, try the app again now and rename your shopping lists! Our journey on how to implement communication internally in apps has come to its end. 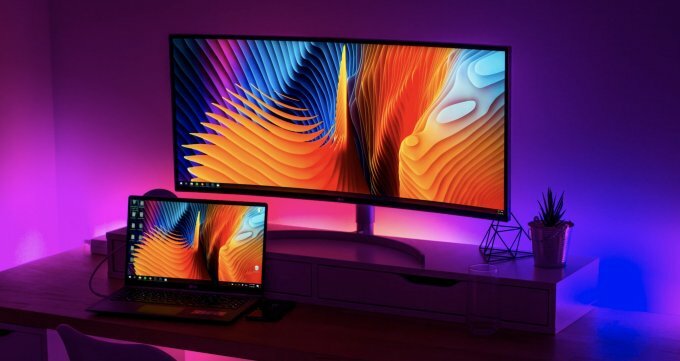 After you comprehend what you read here, most probably you will start wondering which method to choose when it’s about time to use them in your own projects. The answer is that there are no clear rules, and you choose what fits best to your app. As a rule of thumb, the order in which the three different approaches were presented here should also be the order of your preference. Delegation can be used pretty much everywhere, but notifications could be proved a simpler and faster implementation in certain circumstances, for example when data fetching from a server is finished and you want to notify the view controller that is going to display it. Closures are powerful too and ideal for keeping everything in one place, or when implementing delegation or notifications seem to be an overkill for small objectives. Undoubtedly, experience will be your guide, so the more you use them and the more use cases you meet, the easier for you to decide. I hope you enjoyed this post, and if so, share it! Thanks for reading, see ya! For reference, you can download the complete project on GitHub.